The thin, circular objects are smaller than a dime. They are a dull dark gray, and don't look special, at first glance, but 64 third-grade pupils are very excited about them. The disks are ancient Roman coins made of bronze, and the pupils are patiently brushing them and soaking them in distilled water or olive oil to reveal the secrets hiding beneath centuries of crusty grime. Pupils at St. Louise de Marillac School in Upper St. Clair received their coins about four weeks ago. They took them home for their Thanksgiving holiday to continue the cleaning and identification process. They brought them back to school last week to report on their progress. Some still looked like crusty blobs. One boy reported that he could see a snake on a portion of the little coin, and another said he could see legs on one side of his. "Be patient and don't give up," teacher Zee Ann Poerio told her pupils. 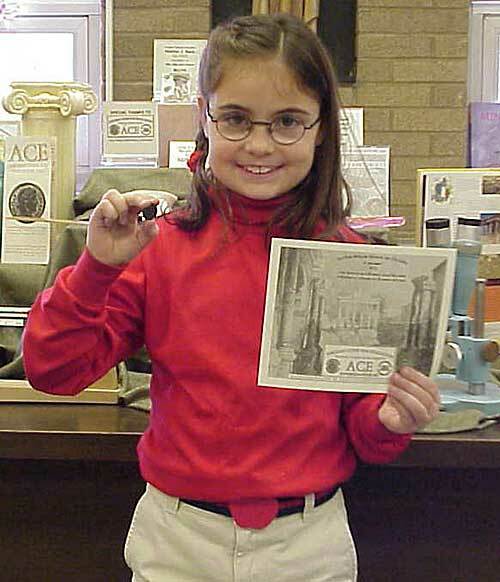 Mia G., of South Fayette, triumphantly displayed her coin, with images visible on both sides. With the help of her parents, teacher, and a Web site, the coin has been identified. It's a bronze coin bearing the image of a Roman Ruler Valentinian I. The coin was struck in 365 A.D.
"Mia is the first person in the class to clean her coin," Poerio said. "She is the youngest person ever to clean and identify a coin in the ACE program. Sometimes you have to look at hundreds of coins" on Web sites to identify a coin. The Ancient Coins for Education program started in 2001. More than 70 schools in the United States and Canada, and one in Europe, are participating in the program. Most, if not all, of those are high schools. Poerio believes St. Louise pupils are the only elementary school participants. Although the coins are ancient they are not worth much, at least not in a monetary sense. "The coins come from a period of great inflation," Poerio said. "Because there are so many of them, they aren't valuable" except as learning tools. Most of them have been found in Europe, including in the Czech Republic. The ACE program was started by coin collectors and dealers who participated in an Internet chat room. ACE is a nonprofit program that makes ancient, uncleaned coins and teaching materials available to teachers with the help of donations from coin lovers. The ACE Web site home page, www.bitsofhistory.com/ace, displays the motto, "Helping to restore and protect." Poerio introduced the coins to third-graders last year. The school's other third-grade teacher, Pamela Walsh, participates with her pupils. "Now when you're cleaning the coins, don't scrub too hard because we don't want to harm the coin's patina," Poerio told pupils. "How many of you are soaking in distilled water?" she asked. A few children raised their hands. Most of them did so when she asked who was using olive oil. "When the water looks dirty, change the water," she said. "Olive oil may become dark or turn blue as chemicals come off the coin." Poerio said last year's coin cleaners loved the project so much that when they entered fourth grade this year, many of them volunteered to give up one recess each week to continue learning about coins and ancient Roman history and culture. "How many of you have relatives or friends who collect coins?" Poerio asked third-graders in class last week. Virtually all of them raised a hand. "How many of you would be interested in collecting coins?" she asked. Once again nearly everyone raised a hand. Like all good teachers, Poerio is pleased and excited by the enthusiasm displayed by the pupils. Fourth-graders are using their ancient coins to make "bullas, or necklaces with a pouch that contains amulets or charms. Ancient Romans presented a bulla to each of their children at birth. The pouch was made of gold, leather or cloth, depending on the wealth of the family. At St. Louise, the bullas are filled with ancient Roman coins. Joanna Weiss, of Upper St. Clair, brought her bulla to class last week. Her red cloth pouch displayed an ancient bronze coin wrapped in jewelry wire. The pouch is worn on a 24-inch strand of black leather that Poerio gave to the pupils. At St. Louise, the coins are part of a bigger program, the study of Latin. "Some people say that Latin is a dead language, but not at St. Louise de Marillac School," Poerio writes in a presentation she makes to other schools and teachers. At St. Louise, "third-graders are studying the history, culture and art of the ancient Romans and bringing Latin to life." "I am on a mission to have Latin taught again in schools," Poerio said. She did not study Latin in school or in college but her interest in Latin was sparked when she read a text called "Minimus," written by Barbara Bell and published by the Cambridge University Press. Bell wrote about teachers without Latin backgrounds using her text in England to teach Latin to elementary school programs. Poerio started the program last year at St. Louise, and then held a local workshop in May. About 40 local teachers attended the workshop, which was sponsored in part by the Pennsylvania Classical Association, Dickinson College Department of Classics and the National Committee for Latin and Greek. Proponents of teaching Latin and Greek say elementary pupils who study the languages show improved scores on standardized tests, Poerio said. They also say that studying Latin improves the English vocabulary and grammar of students and helps them learn other languages, especially French and Spanish, which have Latin roots. Mia from Pittsburgh, PA, holding her Roman coin and Certificate as the first in her class to identify her coin and the youngest in the ACE program to do so.